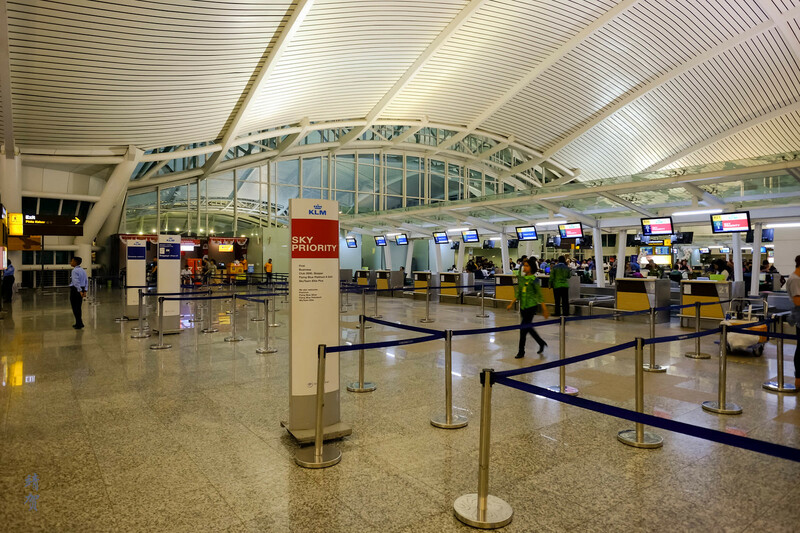 From Bali, I am headed towards Singapore and that meant I bought a one-way ticket between Denpasar Bali and Singapore. With Business Class only a slight premium, it was worth it to get a ticket in the front cabin as I would get more credits to renew my Flying Blue status. Check-in at the counter was quick with not much people in either lines. 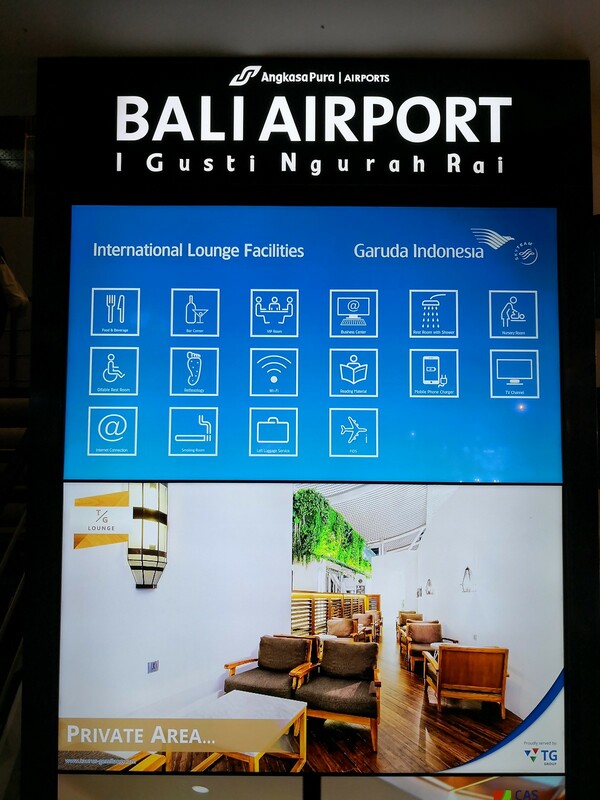 Without any check-in luggage, I was able to get my boarding pass quickly and the agent mentioned that I was able to access Garuda Indonesia’s Business Class lounge in the terminal. From the open-air check-in areas, I proceed through security and immigration which was quick with little to no queues for both. Past immigration, passengers have to walk through the maze of duty free shops before finding a sign beside the elevators for the lounges. 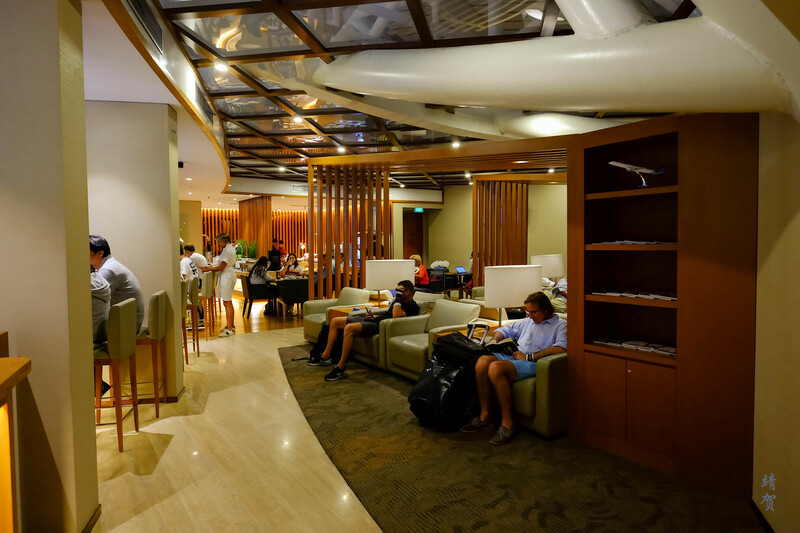 The photo is that of the third party T/G lounge that serves other airlines though China Airlines which is a SkyTeam partner uses this lounge too. 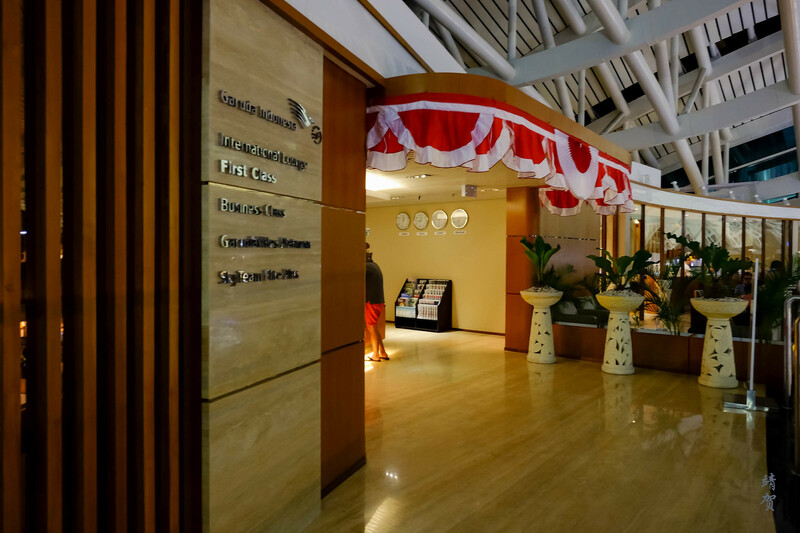 Garuda Indonesia’s lounge reception is located on the second floor on the left side of the elevators. The receptionist checked my boarding pass and motioned me to head to the Business Class lounge on the right side. There is a small First Class section on the left side that I would cover briefly at the end of this review. 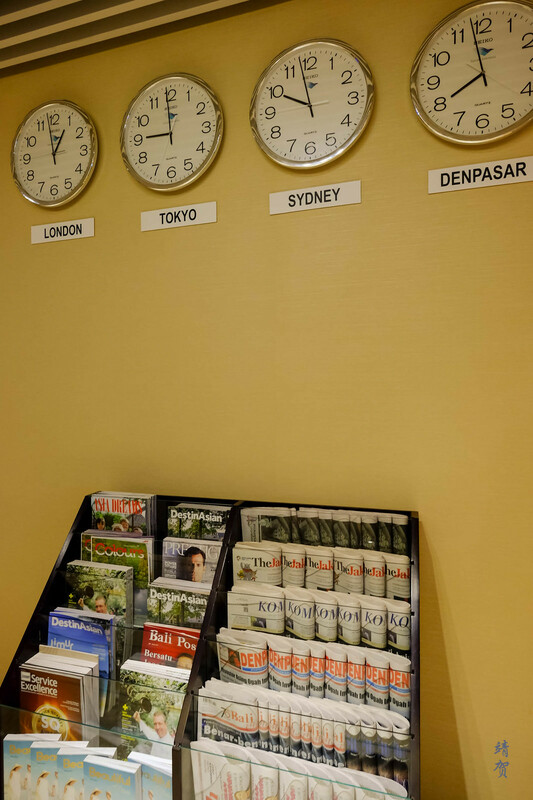 Past the entrance foyer, there is a magazine rack with the time of several major cities worldwide placed overhead. 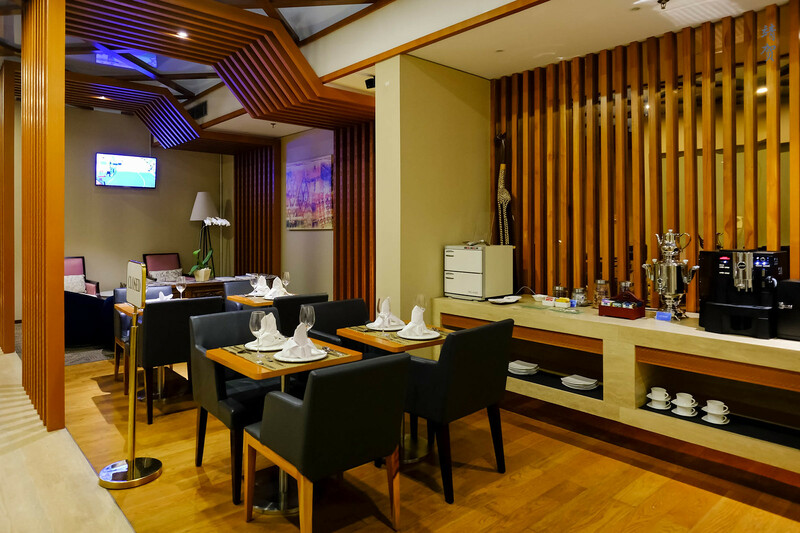 The main section of the lounge is for the dining and buffet areas. 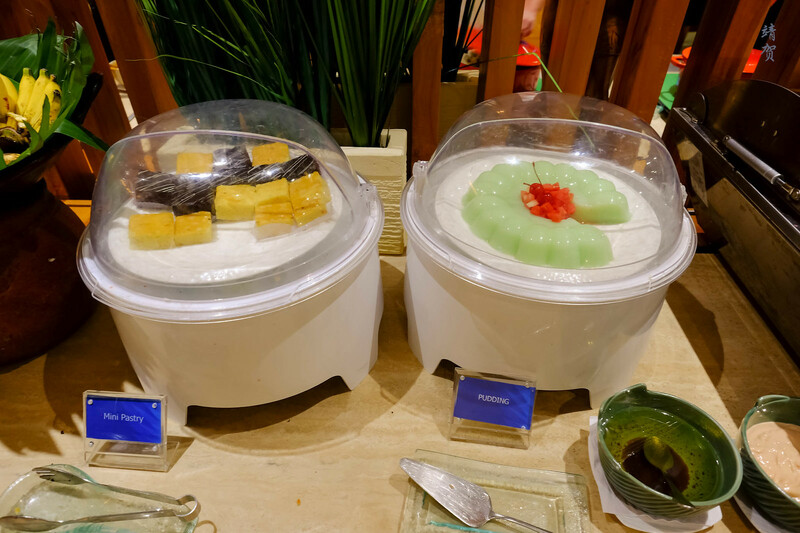 For an International lounge, there was a decent selection of dishes considering Bali is a leisure destination. 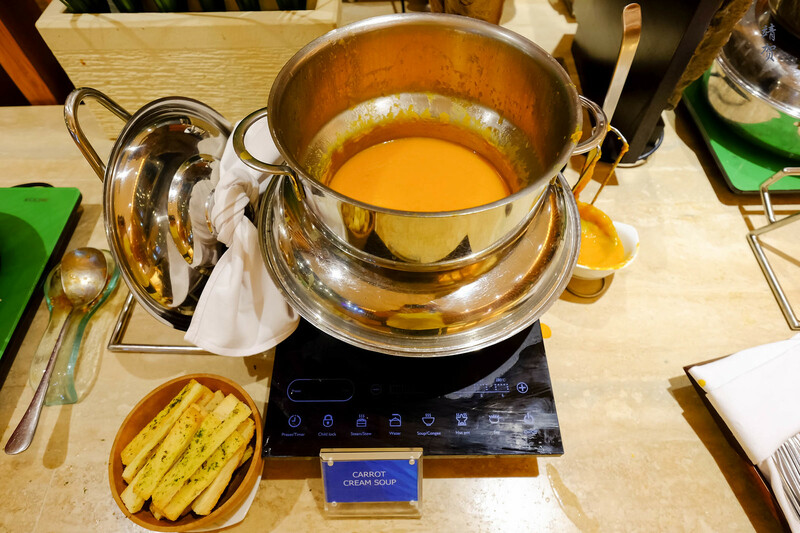 A prominent section is the ‘live cooking station’ which was serving several kinds of pastas made to order. 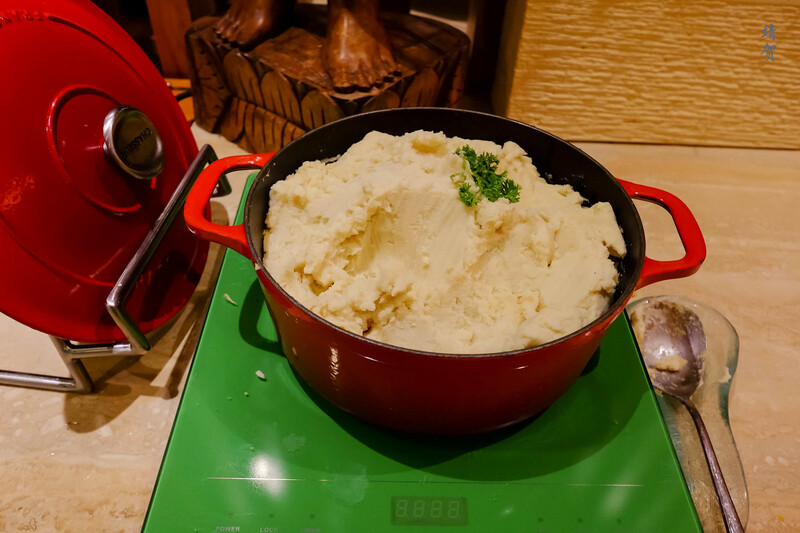 This was perfect for dinner and if guests do not like pasta, there is a butter rice dish or mashed potatoes served on the buffet. 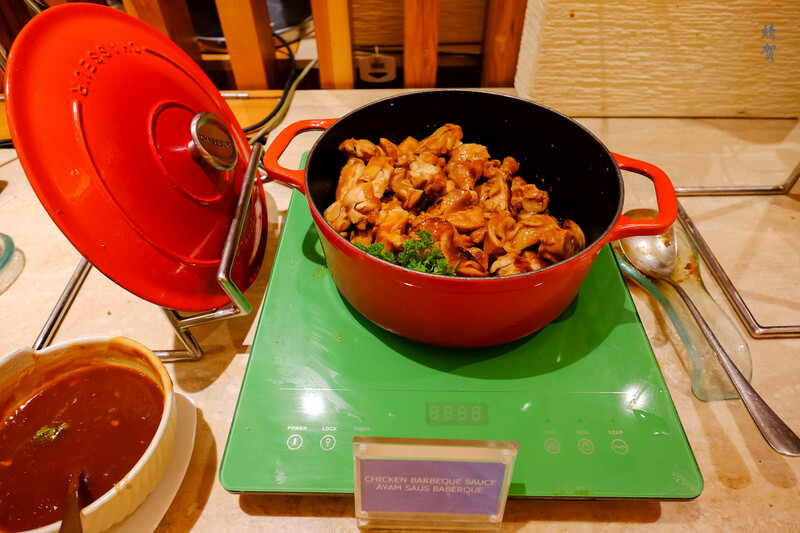 Other hot food served on casseroles across from the pasta station was a mixed vegetable pot and a chicken dish in BBQ sauce. 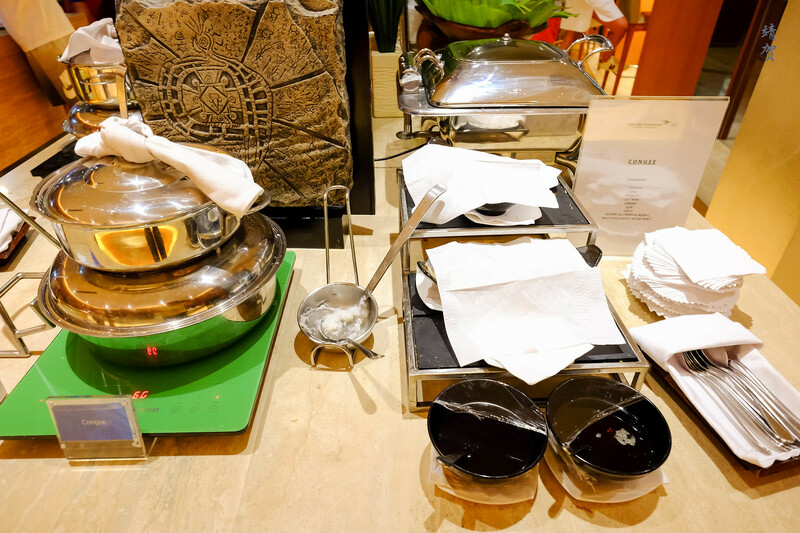 Next to the casseroles was a congee corner with the condiments placed on bowls but shielded with some tissue paper for hygiene reasons. 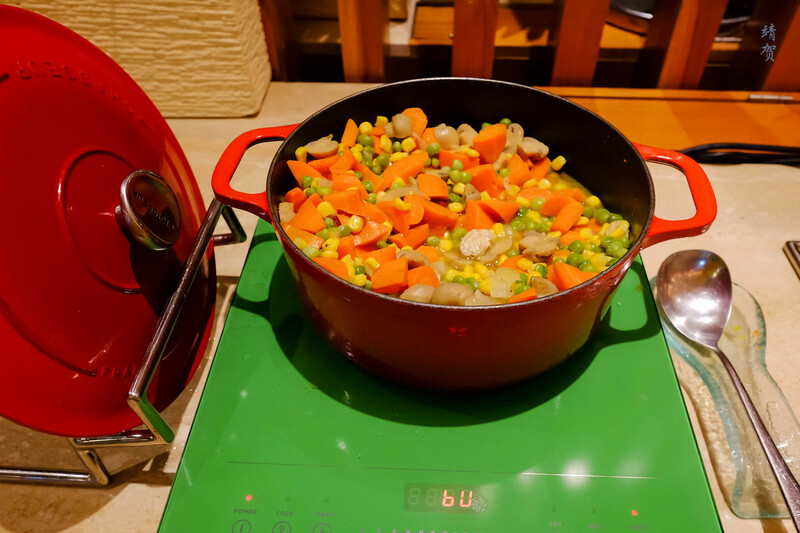 There was also a soup pot serving carrot cream soup on the evening I visited. 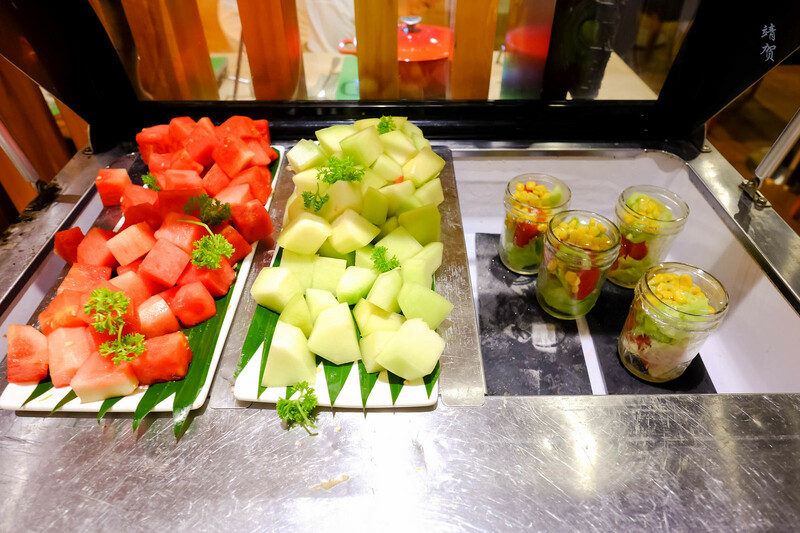 On the other side of the buffet was more snacks. 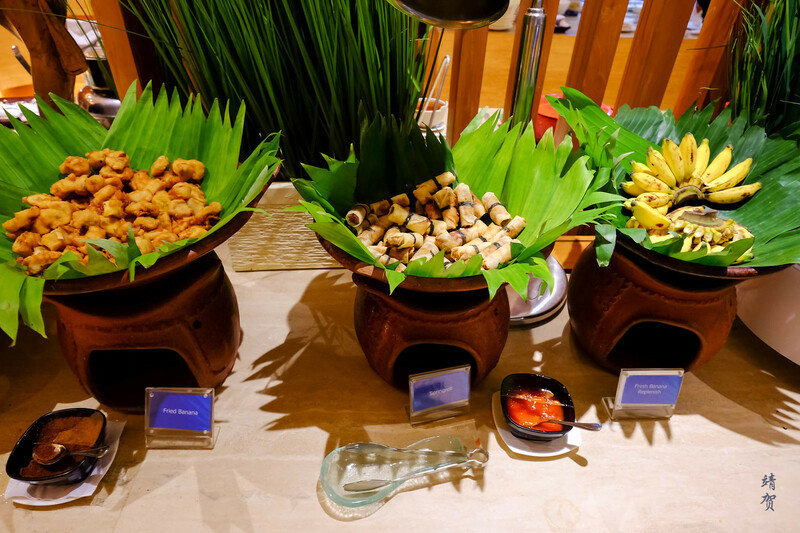 These includes traditional fried banana fritters and fresh ones too. Mini sandwiches and tuna croissants was found inside a tray with some muffins and pastries hidden underneath more cloth for hygiene reasons. 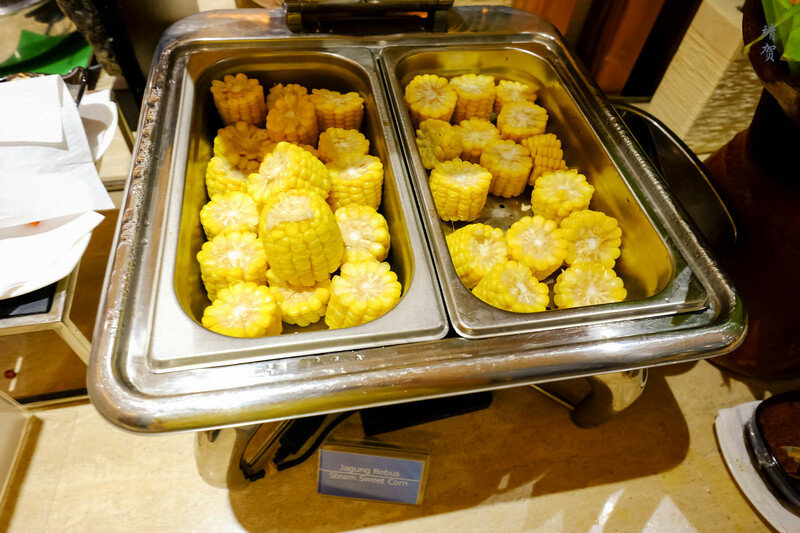 There was also steamed corn served on the buffet, mixed salad on jars and cut watermelon and honeydew. 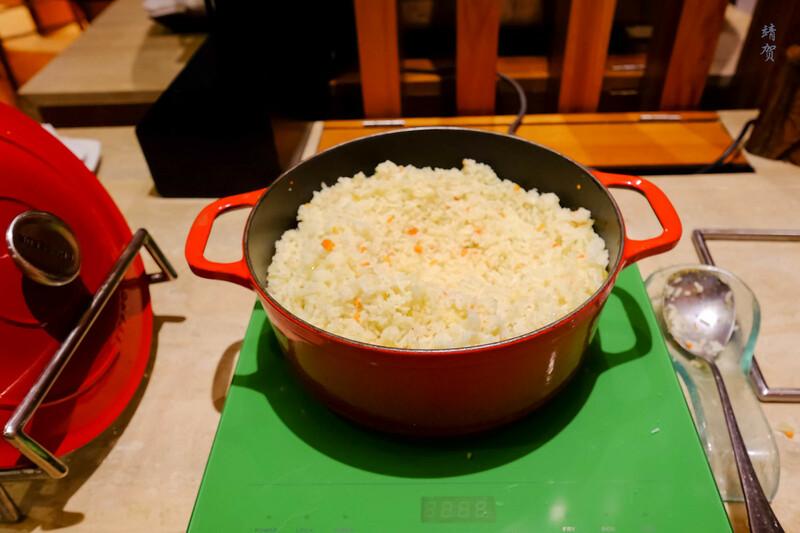 Other sweet stuff includes cakes and puddings. 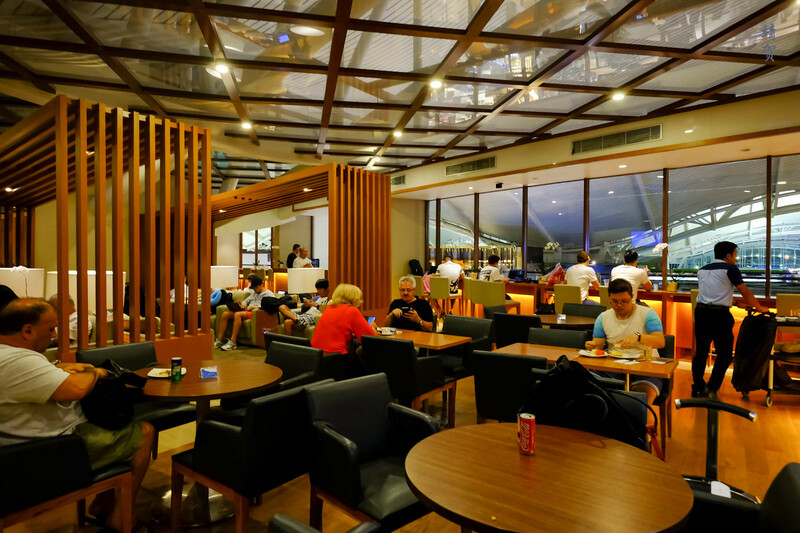 Choice of drinks here does not differ much from Garuda Indonesia’s International lounge in Jakarta. 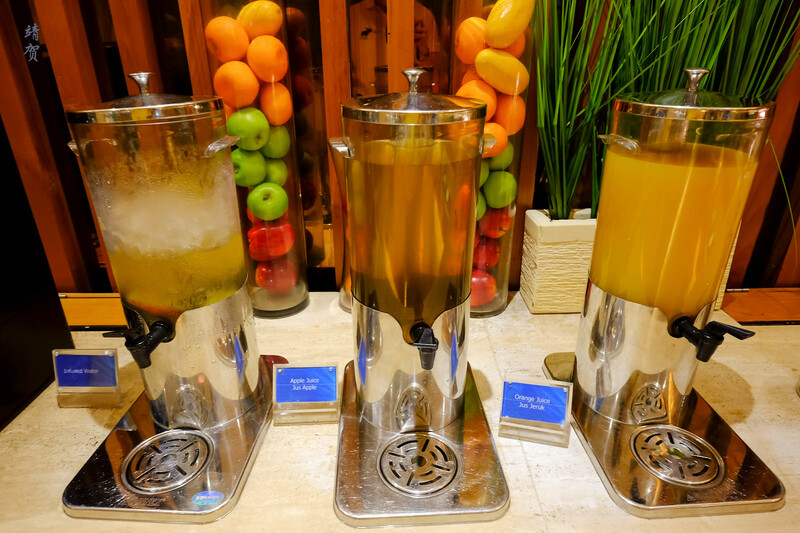 There was the necessary espresso machine along with several kinds of packaged juices from plastic jugs. 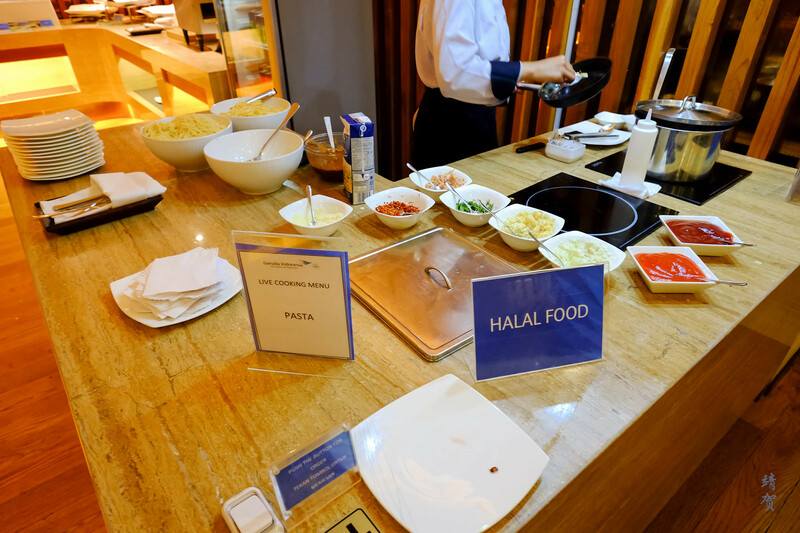 Tea bags were available along with hot water from the buffet as well while guests could also ask for beer from the lounge staff though Garuda Indonesia does not actively display about alcohol choices in the lounge. What was different was this International lounge was a bit small and the dining area was crowded when I arrived, though I did manage to get a sit to have some pasta slightly later. If it gets crowded, there are some bar tables and stools next to the window along the sides. Otherwise guests could still grab some snacks and drinks and move to the lounging section. There is another magazine shelf next inside, indicating the back section to be dedicated more for reading and lounging. Further at the end of the lounge, there was more group seating and due to the layout of the lounge, this section is usually quieter. 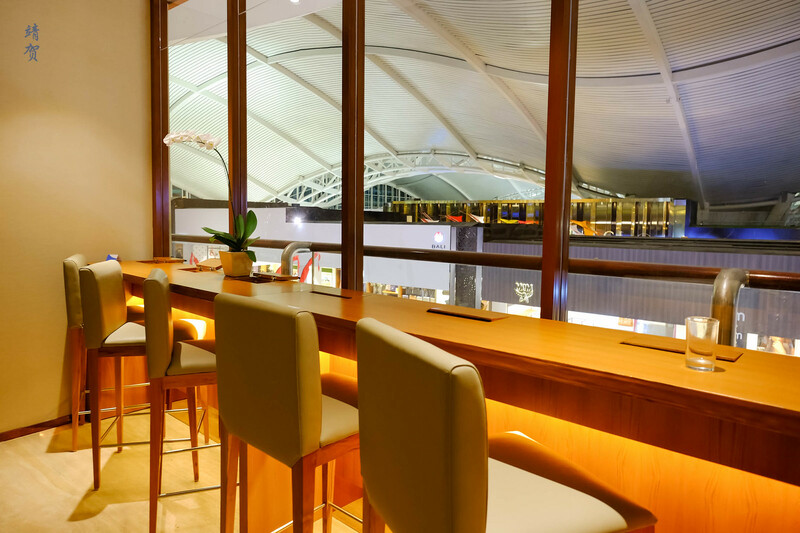 Next to the buffet area, there are doors leading to the deck that overlooks the main terminal. This space is meant for guests who do not mind the noise from the terminal with all the passenger announcements. 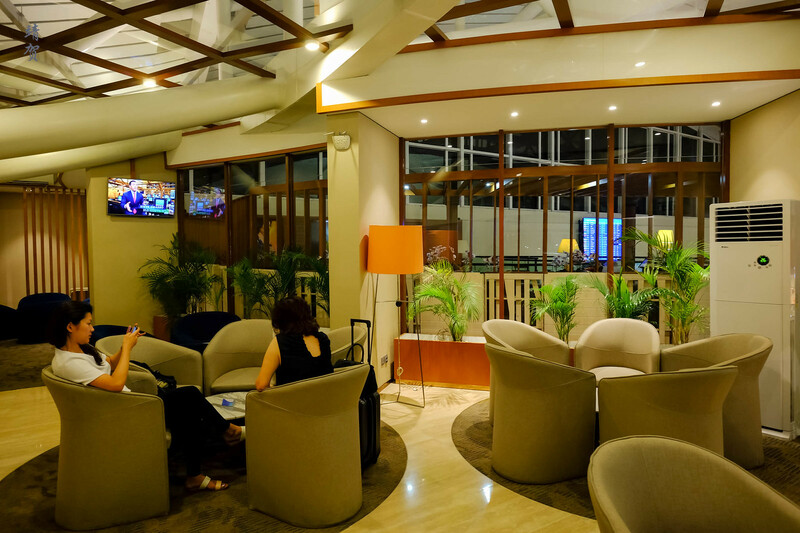 Inside the lounge, guests receive free wifi with the passcode available from reception. 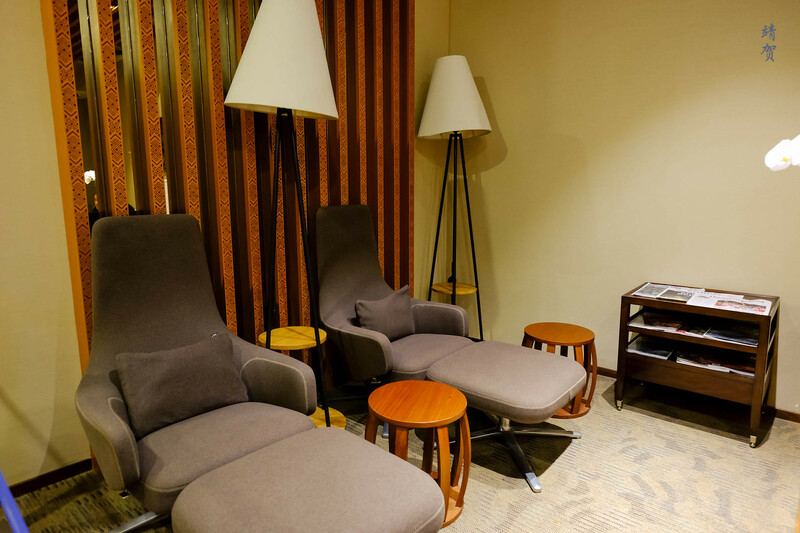 In addition, there is an area for Muslims to pray, which is common to all lounges operated by Garuda Indonesia. 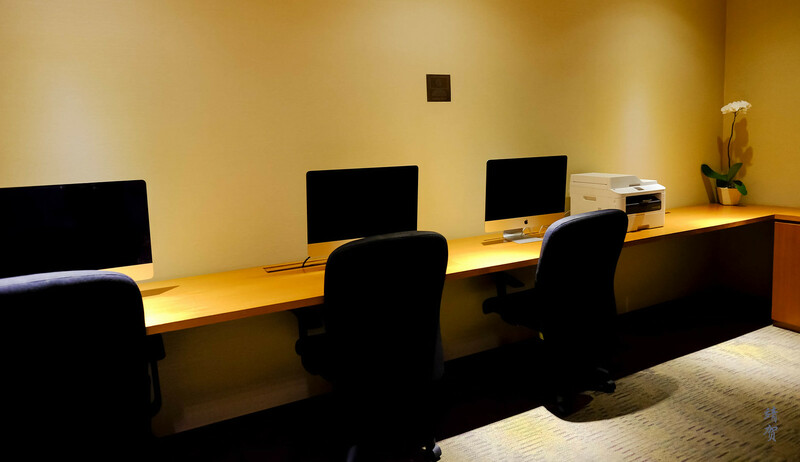 There are Mac workstations with a printer inside the lounge too that guests could use. However it was empty and I did not check if they are operable. 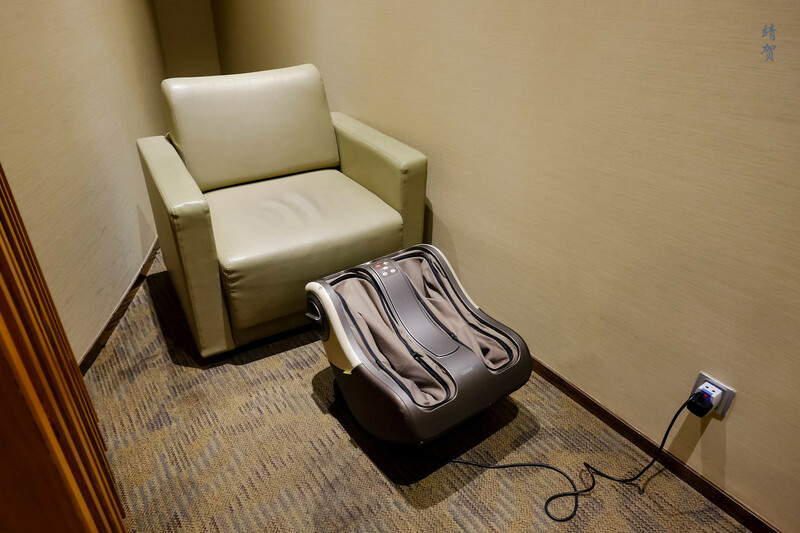 Another common feature is a foot reflexology corner where there is a machine for foot massage placed beside an armchair for guests to use. Finally, there are shower rooms inside the restrooms but as there was an issue with the restrooms in the Business Class lounge, guests needing to use the toilet are asked to proceed to the First Class lounge. This was how I managed to go to the First Class section of this lounge which was empty and more or less closed. 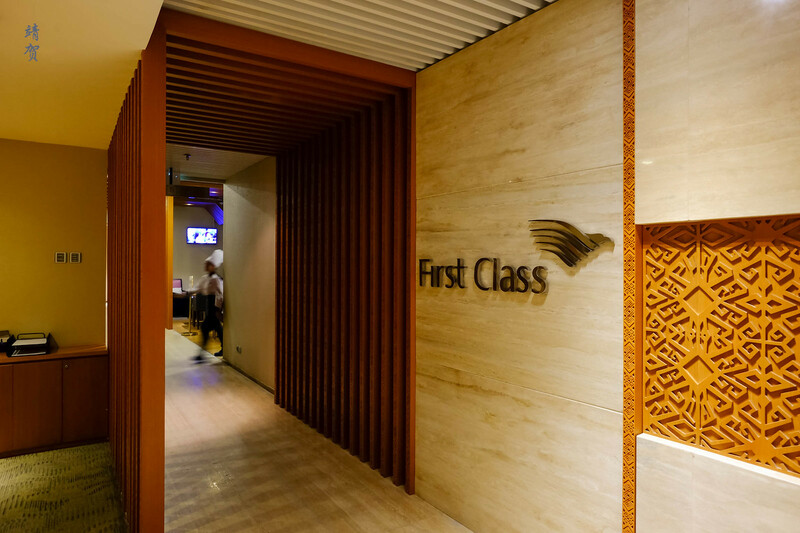 The entrance archway leading to the First Class section has the First Class logo though with Garuda Indonesia eliminating First Class on some of the new 777s it receives, I do not foresee this section existing for any longer. Past the main entrance, there is a small dining section. 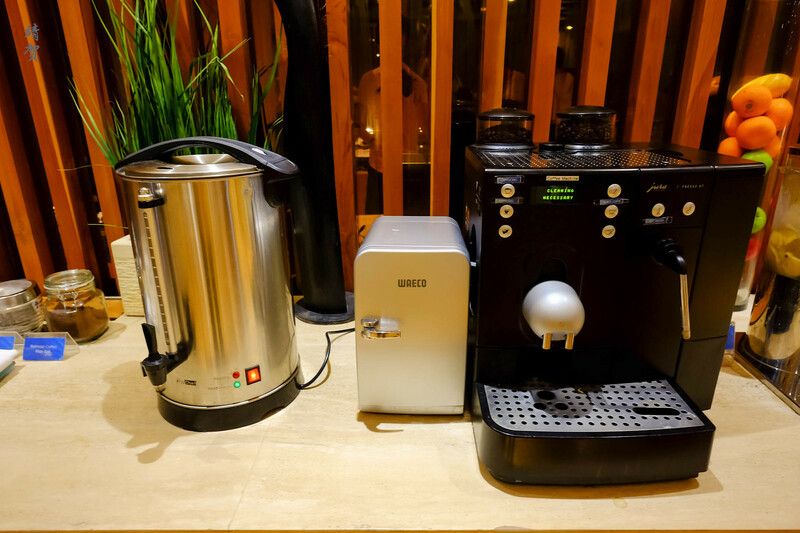 There is no buffet table here, instead, there is a console where guests could make their own cappuccino or brew their own tea. 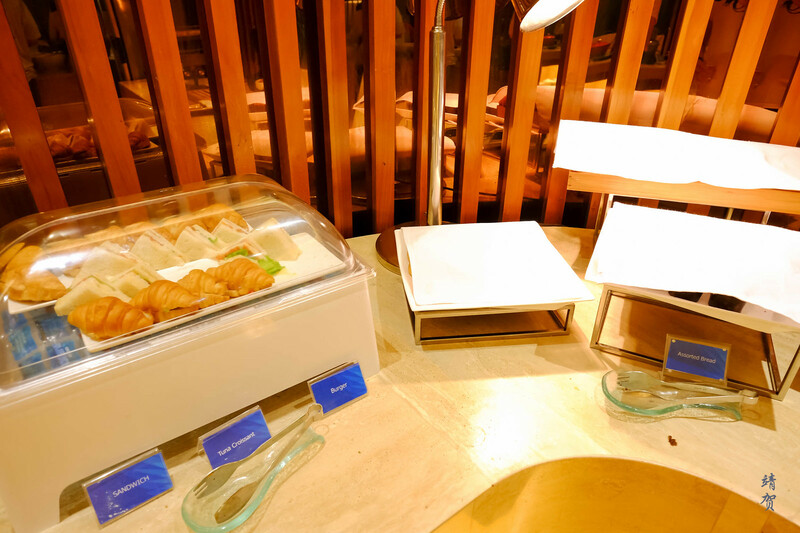 As a First Class lounge, there is an a-la-carte menu which means there is no need to create space for a buffet. Though this section was closed when I was there as there does not seem to be any First Class passengers at all. 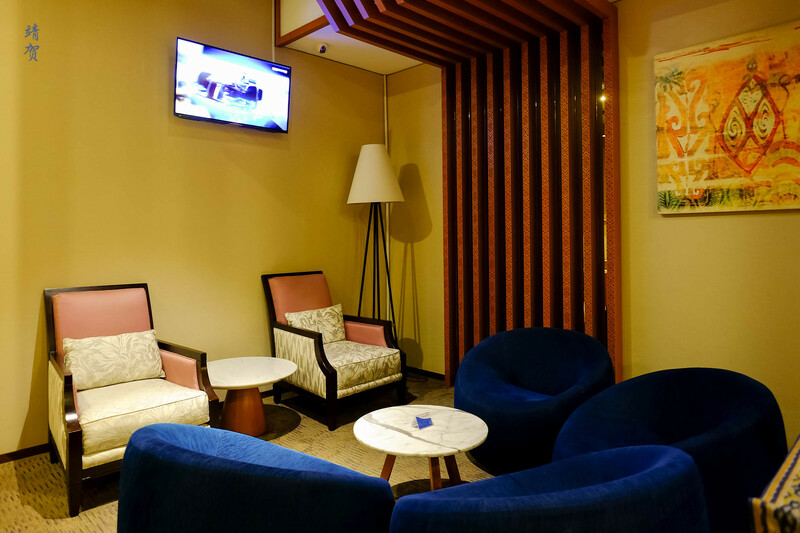 Seating in the First Class lounge comprises of a couple of armchairs with ottomans for a more relaxing reading space as well as armchairs for couples and a few laid-back loungers over a round table. 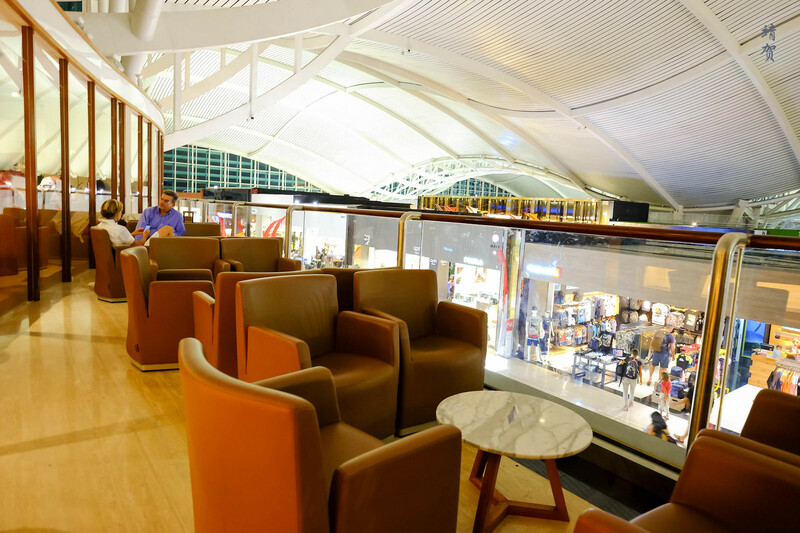 Garuda Indonesia does put in effort to distinguish the First Class section from the Business Class though the International lounge in Bali is small in comparison to their large lounge in Jakarta’s new Terminal 3. 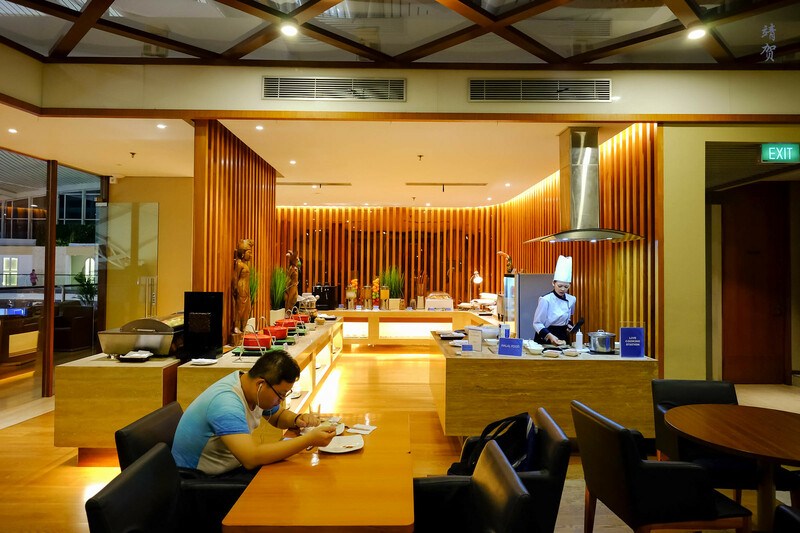 While the food and beverage spread was adequate, I cannot help but feel the lounge is not up to par considering Bali is Garuda’s second hub in Indonesia and I thought they could certainly do with a larger space.